I’ve been an avid reader of Elizabeth George’s mysteries since the aristocratic police investigator, Inspector Thomas Lynley, and his unkempt, authority adverse partner, Barbara Havers, were first introduced in A Great Deliverance in 1988. 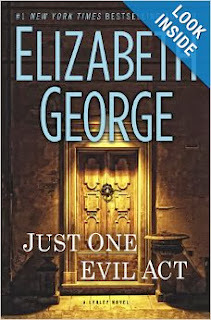 Although American, Ms. George has for the most part of 25 years been my favorite author of British mysteries after P.D. James. This affection for the Lynley mysteries has been quelled since the publication of What Came Before He Shot Her, George’s attempt at arguing the poverty excuse for the ne’er do well who killed the beloved character, Helen Lynley. That book was nearly unreadable and the beginning of the end for me. Out of habit, eternal hope or stubbornness, I’ve continued to give each new installment a try. I’ve read all 18. Just One Evil Act may be the death knell for my continued readership. The Lynley novels have, for me, been about the character development and in Just One Evil Act, none of the long beloved characters act true to the personas that have been developed over 25 years and 18 books. Not in one’s most wild imagination would Thomas attend a roller derby match (at least not more than once on a lark); Barbara Havers would not aid & abet malfeasance; and the other major players would never proceed as described in this book. If Just One Evil Act were one’s first Lynley book, these critiques would not matter. My issues with the story arise from my lengthy relationship with these characters and the careful characterizations that have been developed over the years. While I can understand that Ms. George may have felt the need to shuffle things up a bit, the series began its slide when Helen was murdered a mere six months after finally marrying Tommy and has not been able to recover. While the overly long book is readable, it was not enjoyable for me.